We will respond in 1 business day or less. 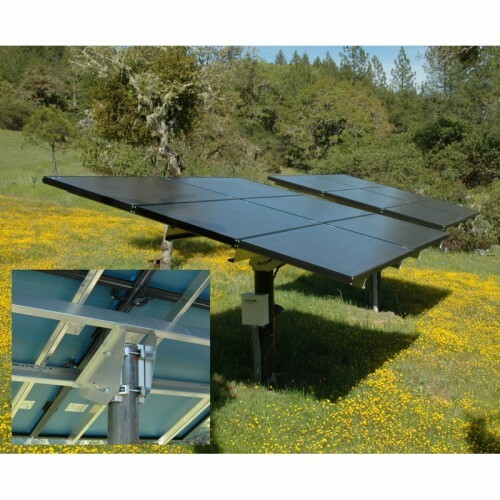 Tamarack Solar UNI-TP/10 Top of Pole Solar PV mounts are a heavy duty mounting solution for small area 12V and 24V modules that are less than 200W. It supports pole diameters of 6 inches and modules from most manufacturers. Top of Pole Solar PV mounts are manufactured using hot rolled steel and heavy-duty corrosion-resistant 5000 series aluminum. With user-adjustable tilt angle settings, these solar PV pole mounts can be used in installations for a wide range of solar applications including off-grid backup systems, roadside signals, moderate load remote systems, and call boxes. As with all of the other product lines, Tamarack Solar provides easy-to-follow installation guides and PE-stamped certification letters for all of their solar PV pole mounts. NOTE: Schedule 40 pipe not included. Generally the Tamarack Solar mounts are ready to ship within 3-5 business days. If the mount you ordered is out of stock, we will contact you within 1 business day with an expected ship date. You will then have the option to accept the new ship date or cancel your order. Either way, we guarantee your card will never be charged until your order ships.